Schoeni Art Gallery is pleased to announce Mongolian artist Munkhtsetseg Jalkhaajav’s, also known as Mugi’s, first solo show in Hong Kong, China. As the international art scene and market continues to strive to find the new threshold of all frontiers (whether it be the visual, conceptual or financial), Mongolian artists have garnered more and more attention. Mugi is one of the most famous female contemporary artists in Ulaanbaatar (UB), Mongolia. Recently, a reporter for the National Geographic picked one of her pieces, which will be exhibited at Mugi’s Earthbound Solo, as a comment on the Mongolian artists rising international popularity, which he attributes to taking on edgy subjects*. 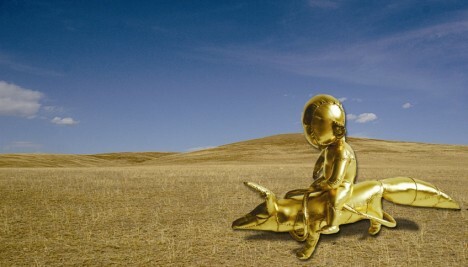 The artwork, SOS, was a life-size soft sculpture of a mother and her baby both wearing gas masks, which had been exhibited at the National Gallery in the Mongolian capital. Beyond the visual edge and interpretation of pollution warning, an issue that all capitals share, especially in Asia, the sculpture illustrates Mugi’s work subject matter: the feminine and its relationship to Mongolian tradition, cosmogony, mythology and symbolism.